This product cannot be shipped to your country currently. Get inspired with the creative DAW. The legend is back. ACID kickstarted the very beginning of loop-based music composition 20 years ago. Now it returns as a fully-featured professional DAW, but still retains that intuitive and slick compositional environment you know and love. It now features dozens of plug-in instruments and effects, a powerful 64-bit architecture and a slick, new interface. You can enjoy all of ACID Pro's new features for just £0.34 a month and always be up to date with the software with future updates, additions, patches and new plug-ins. Your production future is assured with ACID Pro 365! Never miss an update with ACID Pro 365. Enjoy many exceptional new features including a powerful 64-bit engine, dozens of new instruments and effects and many new professional features that make this the most creative DAW out there. And with ACID Pro 365, be safe in the knowledge that your future is secure. Get full support and any new instruments, effects, features and patches as they are released and all for a low monthly cost. 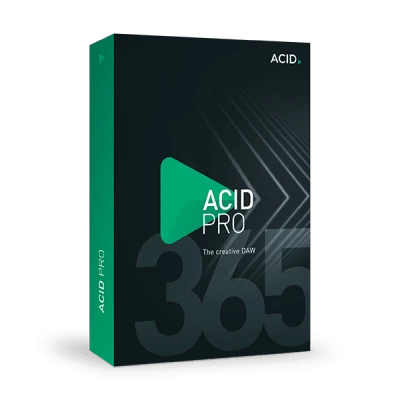 Stay one step ahead with ACID Pro 365! ACID Pro 365 is the ultimate marriage of professional, high-quality features with a slick, loop-based composition environment that allows you to unleash your creativity in an instant. Dozens of instruments and effects – from powerful Vita Solo instruments to the vintage Analogue Modelling Suite – combine with 9 GB of loops and samples to give you all of the sonic armory you need. With a powerful 64-bit architecture, ACID Pro can handle any complex project, and a slick, new interface ensures a productive, intuitive and inspired workflow for composers, producers and remixers. 20 years ago, ACID started a revolution in loop-based music production with real-time pitch and tempo transposition. 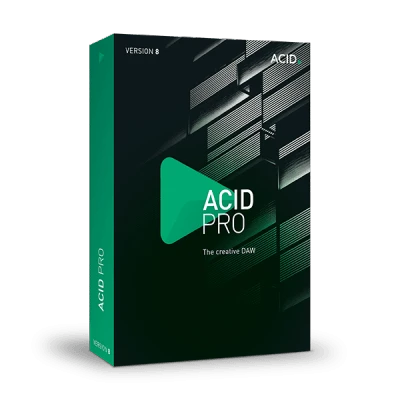 ACID Pro 8 has that innovation at its heart but adds 64-bit power and dozens of creative tools, instruments and effects. It is a professional powerhouse of a DAW for a new generation of creative artists and producers. With everything from slick funk to tight Latino rhythms, Pop Brass has everything you need. It's perfect for a wide variety of genres, from creating the sound of the roaring '20s right through to modern R&B, and is ideal for both elaborate productions and creative jam sessions. Explore ensembles within a symphonic orchestra with this authentic-sounding but easy to use instrument. Create everything from dramatic brass staccatos through driving orchestral thrills to gentle string legato. Analogue Modelling Suite is another exclusive addition, just for ACID Pro 365 users. This suite of classic-style effects includes the AM|MUNITION compressor/limiter, the AM|PULSE transient modeller, AM|PHIBIA tube amplifier/channel strip and the AM|TRACK compressor/tape simulator. If you need more punch in your sound or you need to level out a track then AM|MUNITION is the compressor/limiter for you. It is a dynamic mastering tool which can help your mix sound louder and with added definition. The plug-in can also be used as a limiter and with its combination of features, modes and parameters, it offers not only power but great creative flexibility. The AM|PULSE transient modeller is great for getting creative with envelope characteristics. It is most commonly used on percussive or dynamic sounds although it can also be used simply for reducing background noise. AMIPULSE also includes a saturation control and mix functions within its very flexible harmonic control mode. AM|TRACK is an analog compressor and a tape simulator combination. You can use it specifically for changing and enhancing your input signals, although the plug-in can be used to add character to any audio. Each of the compression and tape saturation sections has its own independent controls and characteristics making AM|TRACK a very flexible tool. AM|PHIBIA combines an optical compressor with a pre and post filter unit to result in a very useful tube amplifier/channel strip. The compressor section can be used for a variety of tasks including being used as a vocal pre-amp or tube guitar amp, or for simply use it to add a warm character to any sound. The filter is very flexible too, with a variety of presets to choose from, depending on the input signal. Can I use the software offline? Yes, the software can be used offline for the duration of your subscription. An internet connection is only required to check for new software updates as well as to validate the program once a month (required monthly for the duration of your subscription). After your subscription expires, you can renew online in just a few easy steps. What happens to my projects? Even if you end or suspend your subscription, your projects are yours to keep forever. That means if you need to work on your project after your subscription has expired, you can renew your subscription and open the project again to continue editing. You will also be able to open the project created in ACID Pro 365 in your perpetual version as long as your perpetual version is equal to or later than the version it was created in (for example, if you created the project in ACID Pro 365 version 8, then you can open it with regular ACID Pro version 8 or later). Will the plug-ins also stay up to date? All plug-ins will be available during the duration of the subscription. With every new version of ACID Pro, the latest version of the plug-ins are included. How do update installs work? You will be alerted when an update is available. Updates are not automatic so you are free to choose when to install the update. Will I lose any version of ACID Pro I already have installed? No. You can use other installed versions in parallel with ACID Pro 365. What happens when I switch from the subscription to the perpetual version? If you end or pause your subscription to ACID Pro 365 and switch to a perpetual version, your projects are yours to keep whatever you decide to do next. You will be able to open projects created in ACID Pro 365 in a perpetual version as long as it is equal to or later than the version it was created in (for example, if you created the project in ACID Pro 365 you will be able to open it in a regular ACID Pro version 8 or later). The product family Sony ACID including the products Sony ACID Pro and Sony ACID Music Studio Studio was taken over by MAGIX in 2016 and since operates under the name of ACID.